I am a strong believer in the notion that there are very few foods that can’t be improved with harissa. It’s such a great thing to have on hand for adding instant flavour to all sorts of dishes, especially a quick throw-together meal like this. I wanted something warm and comforting with minimal hassle; deep, smoky harissa chickpeas paired with velvety baked sweet potato and cut with the creamy tang of crumbled almond feta (substitute tofu feta for nut allergies.) The beauty of a meal like this is the fact you can throw it all in the oven and forget about it while it cooks – that is, if you can resist peeping, as the heady perfume of harissa fills your kitchen. 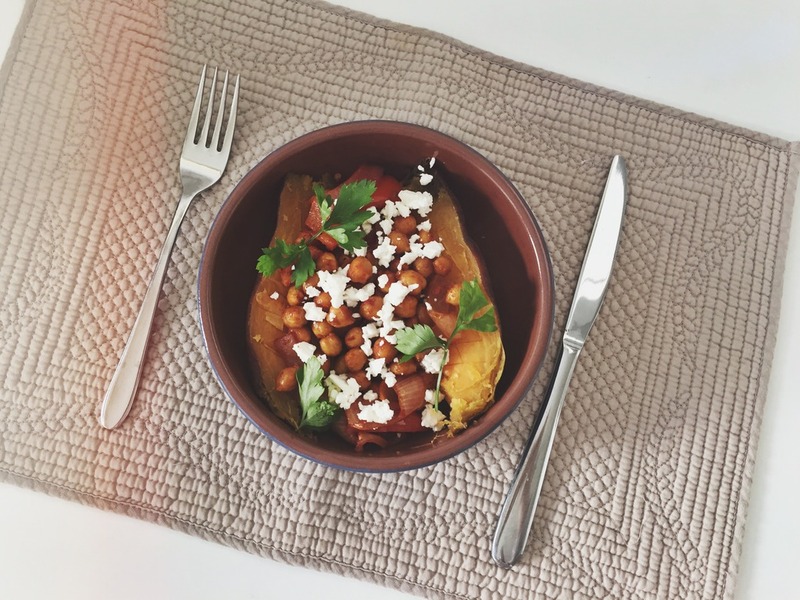 Healthy, simple and delicious; sweet potato topped with harissa roasted chickpeas and tangy crumbled vegan feta. Preheat the oven to 200°c and wrap both sweet potatoes in tin foil. You can place them straight onto a baking rack but this is how I like to bake my sweet potatoes; the steam creates soft skin and tender flesh while the foil captures all the caramelised juices that are released during a long bake – they come out super sticky and sweet every time. Once the oven has reached 200°c, put the potatoes in to bake for 1 hour and 15 minutes (timings based on 200g potatoes, adjust accordingly. While the potatoes bake, combine the drained chickpeas and chopped onion and pepper in a large baking tray, coating them with the harissa, tomato puree, Tamari and garlic oil. When the potatoes have 35 minutes remaining, put the chickpeas and vegetables into the oven to roast. Once tender, take the sweet potatoes out of their foil, cut in half and top with a generous serving of chickpeas, crumbled feta and a few sprigs of parsley. i've never heard of harissa but sweet potatoes and chickpeas are two of my faves, this looks amazing!